As participants in more than 65 countries gather on Friday to commemorate the second anniversary of the collapse of the Rana Plaza garment factory in Bangladesh, one question will loom above all others: Who made your clothes? Mark Fashion Revolution Day—and honor the 1,138 lives lost—by lending your support to an event near you. Below, a selection of highlights. Commemorate Fashion Revolution Day with a one-night-only pop-up shop featuring several Bay Area slow fashion brands. Come share a drink and hear stories and perspectives on responsible local and global clothing production. 6:15 p.m. to 9:30 p.m.
Watch award-winning documentary Cotton Road, take in an eco-friendly runway show, and partake of local vendors who will be on hand with ethical clothing, accessories, and more. Come shop a selection of unique and globally inspired fashion, home decor, and handcrafted items while enjoying live music, food and a fashion show in one of St. Louis’s most unusual venues. All items for sale have a very happy twist: They were made with concern for people and/or the planet. Featuring a discussion about the future of fashion and sustainability with Eileen Fisher, Linda Greer of the Natural Resources Defense Council, and Paul van Zyl, CEO of Maiyet. By invitation only. Join Sass Brown, Amanda Cole, David Dietz, Ben Skinner and special guest filmmaker Andrew Morgan at the Core Club for a conversation on what brands are leading the sustainable movement, how companies are integrating sustainability into their core business models, and what activist groups like Fashion Revolution Day are doing to push the industry forward. Join the Brooklyn Fashion + Design Accelerator and sustainable e-tailer Zady for a screening of the documentary Traceable and a post-film discussion with Traceable director Jennifer Sharpe, sustainable manufacturing expert Sarah Krasley from Autodesk, and Natalie Grillion, co-founder of JUST. ECOfashion, a student organization at Virginia Commonwealth University, along with VCU’s Department of Sociology, and local shop Love This will be teaming up to bring participants a unique experience in honor of Fashion Revolution Day. To symbolize the vast number of countries where garments are manufactured, they’ll have a “T-shirt clothing line” where each T-shirt will represent the top manufacturing countries in the world. Participants will be asked to mark an “X” on the shirt that corresponds to their garment’s country of origin. 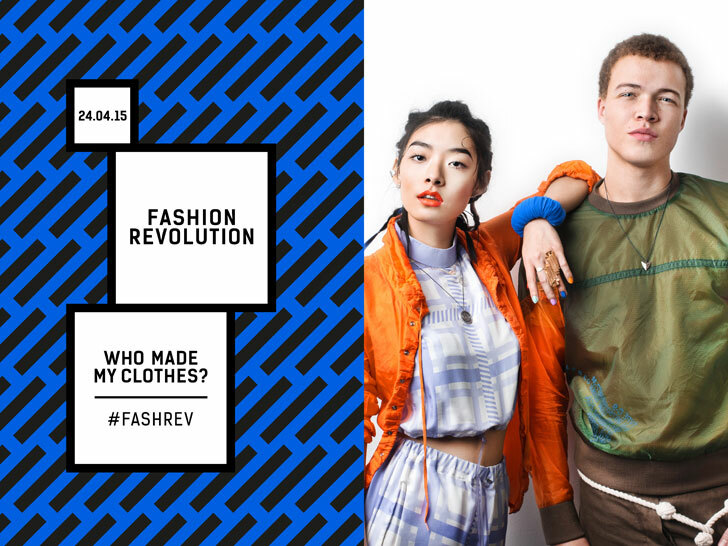 If you’re a lover of Australian-made, fair-trade, sweatshop-free, or ethical brands, or just curious to discover some new emerging fashion talent and credible threads for your wardrobe, pop along to support Fashion Revolution Day in style. 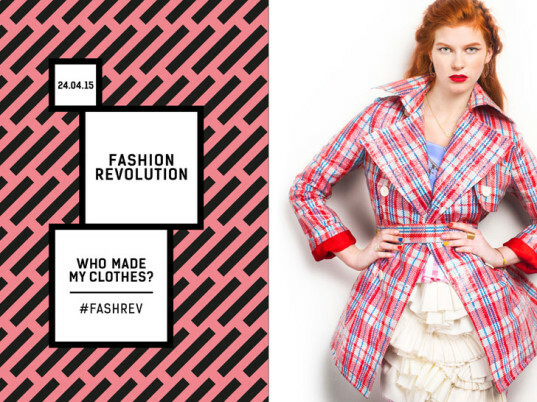 Attend a public sew-in at OCAD University and hear firsthand from fashion students, designers, faculty, and consumers about how the factory collapse and an increased awareness about the apparel industry has personally affected them and the way they consume clothing. A public walking tour along Oxford Street, London, will highlight the shameful role of high street brands in the two years since the Rana Plaza disaster in Bangladesh in which over 1,100 workers died. Fashion campaigning groups Labour Behind the Label and War on Want will lead fashion lovers from shop to shop highlighting the role U.K. high street brands such as H&M, Gap, and Benetton have played in denying justice to Bangladeshi garment workers. It’s clear-out time! Bring all your unworn or unwanted garments and swap them for new-to-you clothes to refresh your wardrobe the eco-friendly way. Enjoy a glass of wine in a lovely relaxed and social environment, and browse the rails at your leisure. Shop ethically for the best in secondhand and vintage clothes and shoes with the knowledge that every purchase made will be committed to an essential cause. All sales made on the night will be donated to the National Garment Workers Federation, a Bangladeshi trade union funded by TRAID, which will distribute funds directly to the most in need victims of the factory collapse. Lily Cole and Impossible, the platform that encourages sharing and transparent manufacturing, are coming together with Futerra to host an Impossible Swishing party. Swishing is a guilt-free way and fun way to swap clothes you no longer wear for something you love. The rules are simple: bring at least one good quality piece of clothing, or an accessory or two, and then get swapping. By invitation only. The exhibit will showcase 16 reclaimed garments—the average number disposed of annually per person—to support cherishability. Costume designer Iona Barker will also deliver a short master class demonstrating how to give back life to old clothes. Clotho is hosting a fashion “hackathon” to upcycle some of its old stock—dresses with little rips, jackets with missing buttons, and tops with unravelling hems—into new items. Anyone can come, but it’ll help if you know how to sew. Urge The Children’s Place to secure the remaining $7.5 million owed to the Rana Plaza Donors Trust Fund so that Rana Plaza survivors and victims’ families receive the full compensation due to them by April 24, 2015. 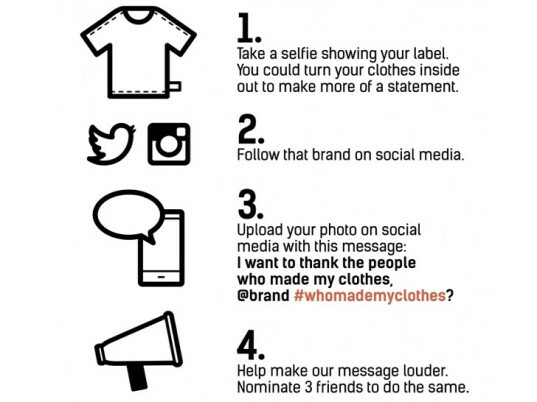 By taking an selfie with the label showing (wear an item of clothing inside out for added impact) posting it on social media and asking the brand Who Made My Clothes? you can show support for greater transparency throughout the fashion supply chain. The more people who ask #WhoMadeMyClothes, the more brands will listen. Tell Yoox and Nordstrom to take the next step toward transparency by specifying the countries of origins on their garments. As participants in more than 65 countries gather on Friday to commemorate the second anniversary of the collapse of the Rana Plaza garment factory in Bangladesh, one question will loom above all others: Who made your clothes? Mark Fashion Revolution Day�and honor the 1,138 lives lost�by lending your support to an event near you. Below, a selection of highlights.